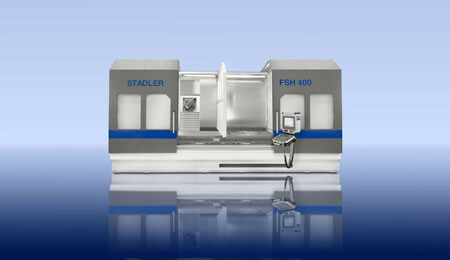 With the FSH travelling column series in combination with the NC-rotary table and the swing milling head you can have a 5 side machining. The FSH-series uses a swing damping mineral cast in the machine bed as well. Above all the FSH-series offers the possibility of a pendulum machining. Thanks to a splitted working area, you can clamp new work pieces during machining. Therefore you can raise productivity while lowering your setup costs simultaneously. The drive concept in the X / Y / Z axis enables accelerations from up to 2 m/s² and rapid traverse speeds from up to 35 m/min. As individual as your needs as individual the machine can be configured. As customer, you can decide if you need a rotary table, a vertical milling head or even a swing milling head. With our machine tools we always offer the best suited solution for your tasks. For more details please take a look into the technical details.